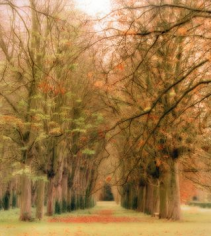 Lynn Geesaman creates large-scale, color photographs of public parks and formal gardens throughout the United States and Europe. Exploring the artificial nature of these cultivated landscapes, Geesaman’s highly aestheticized images emphasize geometry and form over subject matter. 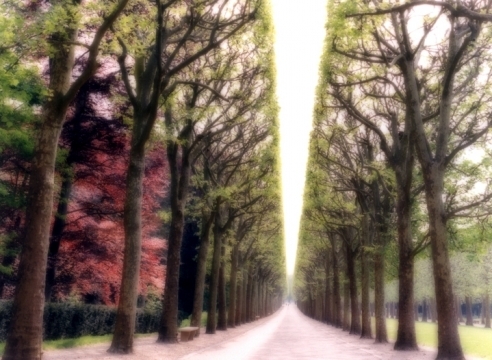 Although devoid of people, human intervention is nonetheless present through the manicured conditions of the hedges and the symmetrical placement of the trees. 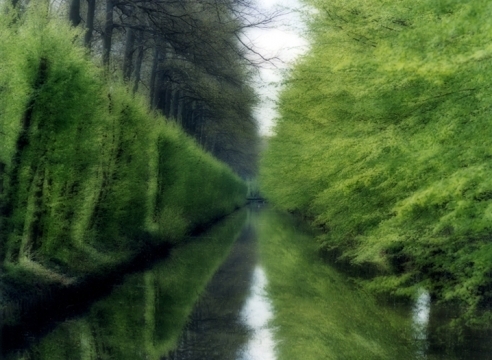 In her black-and-white photographs taken in Damme, Belgium, in 1992 and 1995, uniform rows of slender trees become a series of parallel lines, running alongside a canal or converging at a far-off vanishing point. 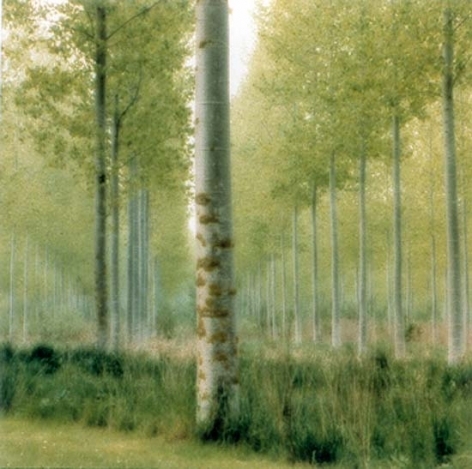 A more recent color photograph, taken in Damme in 2004, continues this line of investigation, recalling the “zips” of Barnett Newman’s canvases with the tree trunk in the foreground that bisects the pictured landscape. This tension between abstraction and representation is present in much of her work, and is achieved partly through her specific printing technique. 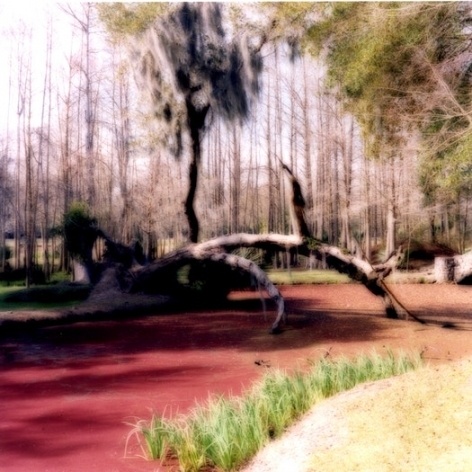 This process intensifies the color and gives her photographs a soft, almost out of focus, quality, which also evokes the early Pictorialist photographers. Through these dreamlike presentations, the artist taps into the emotional undercurrent that connects her to each of the places she photographs, offsetting the initial, highly formal look of the work. 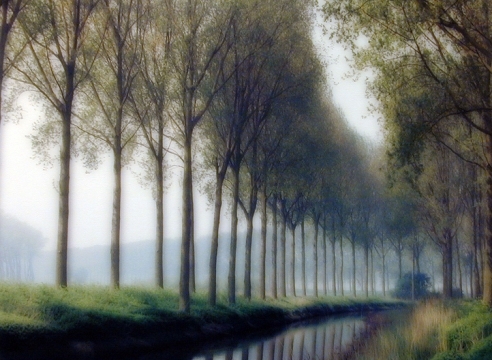 Through her particular use of color and light, Geesaman creates a tension between the highly structured landscapes and their illusory, or otherworldly, nature. Geesaman was born in 1938 in Cleveland, Ohio and graduated from Wellesley College with a degree in physics. She has won numerous grants and awards including the Bush Foundation Artist Fellowship in 1991, and the National Endowment for the Arts Regional Visual Arts Fellowship Award for the Midwest, 1993-1994. 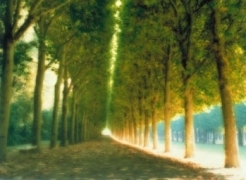 There are three monographs published on the work of Lynn Geesaman, entitled "Poetics of Place," 1998, "Gardenscapes," 2004, and “Hazy Lights and Shadows: Lynn Geesaman,” 2007. Her work has been exhibited in numerous institutions including International Center of Photography, New York; The Houston Center for Photography; The Center for Photography at Woodstock, New York; Tucson Museum of Art; High Museum of Art, Atlanta; Walker Art Center, Minneapolis; and the Museum of Fine Arts, Santa Fe. Her work is represented in the collections of the Whitney Museum of American Art, New York; Philadelphia Museum of Art; The Art Institute of Chicago; The Museum of Fine Arts, Houston; and the Bibliotheque Nationale de Paris.